Do you see something, that doesn’t belong? Jack, the one without horns, is just one of the anomalies you’ll come across at Grove Creek Farm. Located about 20 miles east of Athens, tucked into the Georgia countryside, is a unique couple with a unique vision. The 300-acre plot has a rich history that has seen the passing of many people and many crops. Arrowheads and quartz flints can still be found on the property near the river which is thought to have attracted Native Americans from the Broad River populations in Athens. The 18th century brought tobacco, which was replaced with cotton in the 1850s. 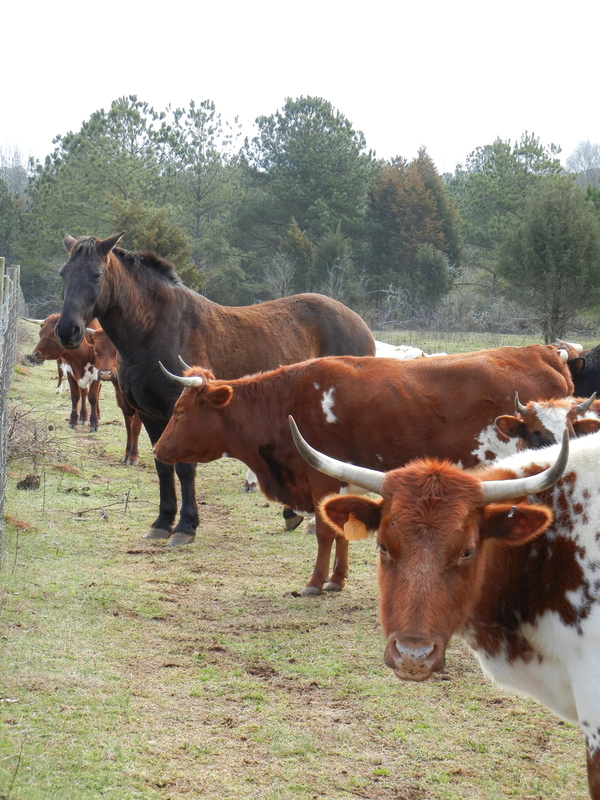 Later row cropping began with the Roosevelt era and fast forward to today, Grove Creek Farm raises grass-fed beef and provides an anthropological farming experience. 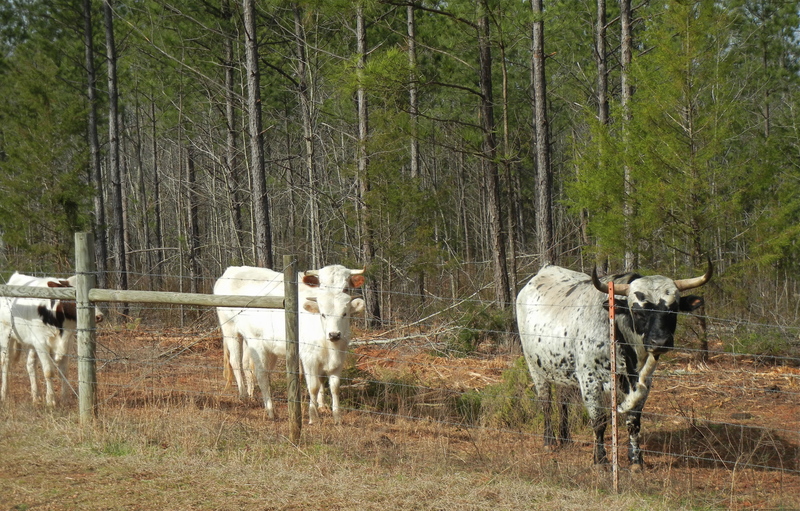 The land is laden with short leaf and yellow pines shared with the prettiest cows I’ve ever seen. Conventional wisdom might tell us that livestock and trees don’t co-exist but Dani, owner of Grove Creek, insists there are many benefits to using this system of agroforestry. Silvopasturing is the technique that integrates livestock, foraging and forestry on the same land. These systems are designed for the production of both trees and livestock. The combination is truly beautiful and benefits the soil, livestock, short and long-term returns, wildlife diversity, and water quality. Dani’s late father Dr. Robert Rhoades, an anthropology professor at the University of Georgia, founded Grove Creek on the philosophy that knowledge from the past should guide today’s principles. Dani is following out her father’s dream to see the land as a classroom to teach students and any interested folks about agricultural anthropology with a hands-on element. The plans are in their beginning stages now. 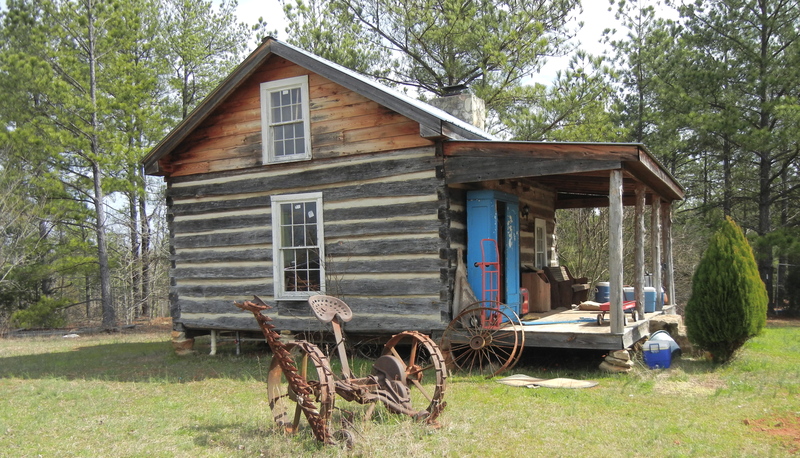 Part of the farm includes seven historic log cabins that were brought to the property from different locations across the nation. Dani wants to use these to reenact an old way of life. Also strewn about the property are old farm tools that show how farming was done in the years past. Connecting with the land means connecting with the past. The once overused and degraded soil is slowly but surely returning to its once fertile state – what long ago attracted animals and people to the area. Dani is gaining momentum while maintaining her reverence for her family’s and her land’s roots. This time capsule deserves more than a visit on the internet, if you’re ever in the area, swing by and see what she’s doing with her land. This entry was posted in Food Warrior Interns, On the Farm and tagged atlanta, food warriors, grass-fed beef, grove creek farm, lee carella, Real Time Farms, silvopastoral system, silvopasture. Bookmark the permalink.